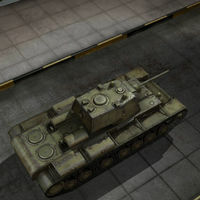 Der KV-220-2 ist ein sowjetischer premium schwerer Panzer der Stufe 5. Die Weiterentwicklung des schweren Panzers KV zum KV-220 wurde im Sommer 1940 begonnen. Der Prototyp wurde am 5. Dezember fertig gestellt. Anders als die übrigen KV-Modelle hatte dieser Panzer eine verlängerte Wanne, zusätzliche Stützrollen, eine verstärkte Panzerung (100 mm) und einen neuen Turm mit dem 85-mm-Geschütz F-30. Im Herbst des Jahres 1941 wurde die Produktion des KV-1 eingestellt. Das Fahrzeug erhielt den in großen Mengen hergestellten KV-Turm und wurde an die Front geschickt. It is identical in all ways to the KV-220 Beta-Test but without the T (test) symbol. It was granted as a gift to players on the RU server and is very rare outside of it. 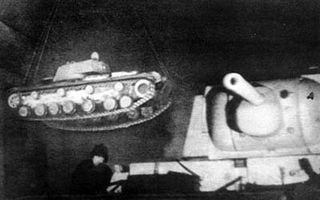 This tank has a KV-3 hull with a KV-1 turret, armed with an adequate gun for its tier. While having better armor than the KV-1, it can still easily be destroyed by an upgraded KV-1. 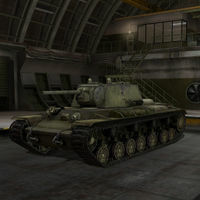 This tank was originally only available on the RU server, but has now been available in the EU, NA and ASIA portal Gift Shop several times. Angling your armor is the name of the game in this tank. 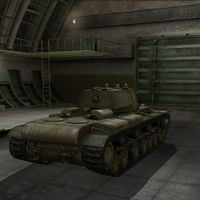 Put in the hands of a skilled heavy tank driver, is it capable of holding an entire flank. The only real threats when in tier 5 games is derp guns firing HE, artillery, and some other heavy tanks like O-I Exp from close. You can't overestimate this tank though, as its front can be penetrated if it is left unangled. Ramming with this tank can be very effective. Some players go so far as to use the Controlled Impact skill, although that can be difficult if transferring crews back and forth from another tank. No reasearch required, as this is a premium tank. KV-220 with its original turret and armament. KV-220 being transported by crane in the background. The seventh road wheel and fourth idler are clearly visible. Actual name is KV-220-2. 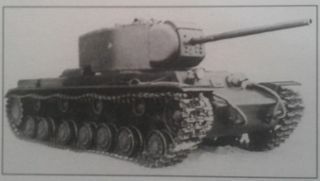 The KV-220 was equipped with the T-150-220 turret and 85 mm F-30 gun. 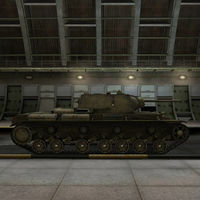 Though a KV-3 hull, its current armor thickness is 100/100/80 instead of 120/90/90. Actual armament was the 76 mm F-32, not the ZiS-5. Known engine horsepower is actually 850, not 650. Diese Seite wurde zuletzt am 25. Oktober 2016 um 13:56 Uhr geändert.